Do you know that your phone also has a feature of Safe-mode same as in windows or mac? Yes it’s right, in safe-mode the phone runs faster and we can troubleshoot two main problems by entering into Safe-mode by just keep on pressing sleep/power button and then hold Power Off the Device on screen and this will restart your phone to enter into safe-mode. If your Android phone crashes or freezes or get restart again and again then you should enter into safe-mode and delete the latest app that you installed which causes problem to the phone for not working correctly. Just go to Settings >> Apps to uninstall. To exit the safe-mode, Simply Shutdown and Restart your phone by pressing Power button and then your phone will get start again to the normal mode automatically. 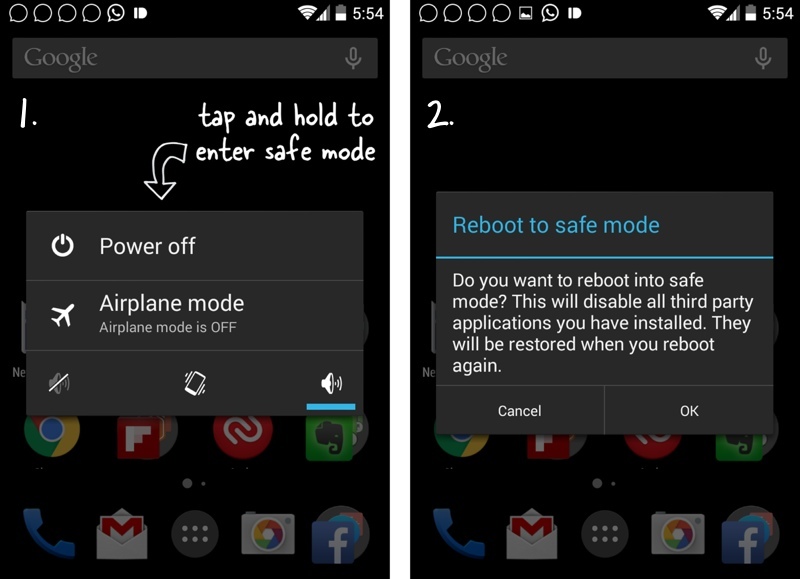 thus, Safe-mode is useful and even most necessary part of Android smartphones to get rid of any kind of trouble. But if you have facebook, Twitter or Dropbox then you have to login again into them after entering Safe-mode.